Getting that corner office with the great view might make your work life more fun. Getting a raise might make your job more enjoyable. Even better coffee in the break room might make your workday more pleasurable. Here’s something else that will improve your job satisfaction: Learning how to take, accept, and use criticism. Statistics from our Sensitivity to Criticism Test reveal that people who tend to get defensive when given negative feedback – even if it’s offered in constructive way – are also more likely to dislike their job. Less defensive employees, on the other hand, tend to be happy with their job. 29% of unsatisfied employees believe that their poor performance is due to the fact that the expectations and standards that their customers, colleagues, or manager set for them are too high (compared to 15% of satisfied employees). 30% of unsatisfied employees perceive most people as being “cut-throat,” and believe that these same people intentionally use criticism to bring others down (compared to 16% of satisfied employees). After receiving negative criticism, 43% of unsatisfied employees respond by becoming disengaged from their job. They put in the bare minimum effort to get tasks done (compared to 18% of satisfied employees). 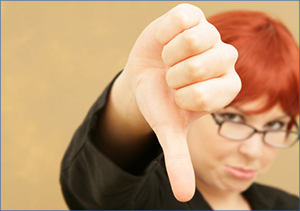 44% of unsatisfied employees feel insulted when someone rejects their ideas (compared to 29% of satisfied employees). When they do recognize that the criticism is justified, 47% of unsatisfied employees indicate that this realization makes them feel like a failure (compared to 23% of satisfied employees). 48% of unsatisfied employees feel degraded when people point out their mistakes (compared to 24% of satisfied employees). 48% of unsatisfied employees indicate that others will often avoid offering them advice or an opinion for fear that they will get offended (compared to 31% of satisfied employees). 55% of unsatisfied employees don’t like being given orders or being told how to do something (compared to 38% of satisfied employees). 59% of unsatisfied employees get discouraged when they’re told that they haven’t done their best work on a project (compared to 39% of satisfied employees). 66% of unsatisfied employees have an Average or Below average performance rating (compared to 23% of satisfied employees). 74% of unsatisfied employees are very hard on themselves when they fail (compared to 54% of satisfied employees). 79% of unsatisfied employees have self-esteem issues (compared to 46% of satisfied employees). While there are many other factors that can contribute to job dissatisfaction, an inability to accept negative feedback certainly makes the list. Knowing how to handle criticism is a necessity in almost any job field. The higher you climb the career ladder or the more successful you become, the thicker your skin will need to be. Accept that everyone makes mistakes. Being ashamed of mistakes or failure is actually one of the greatest errors you can commit. Making mistakes is part of being human, and to deny imperfection is to deny who you really are. Swallowing your pride and admitting when you are wrong does not make you inferior to anyone. In fact, to admit a fault and take ownership of it is a sign of strength and personal courage. Look at the disadvantages of not accepting feedback. If you find yourself getting tense or upset when you receive criticism, think of the situation this way: Would you rather be kept in the dark, not knowing what you're doing right or wrong, or would you rather have the chance to fix whatever needs to be mended before the problem gets worse? o Take note of criticism offered by clients, colleagues or managers, whether it’s constructive or not. Behind their “bite” may lay a morsel of truth and helpful insight on areas where you (or your product, service, marketing plan, etc.) can improve. o Successful actors continuously hone their craft. Technology companies are always looking for ways to improve their product. Becoming aware of your weaknesses and working hard to on overcome them is the key to your success. o If your performance review brings to light gaps in your skill set or conduct that needs to be amended, come up with a plan of action on how to develop these areas. Don’t be afraid to ask your manager for suggestions on what you can do to improve your performance. o Keep track of your progress after implementing improvement strategies. For example, are you able to complete tasks more efficiently? Are you receiving fewer customer complaints? Are you making more sales? Is your supervisor finding fewer mistakes in your work? Find a tangible way to measure your improvement. If you’re interested in using the Sensitivity to Criticism Test (SCRT) or other tests for HR purposes, request a free trial for ARCH Profile here. Ready for a test drive of ARCH Profile, the delivery system for PsychTests’ assessments? All you need to do is ask!